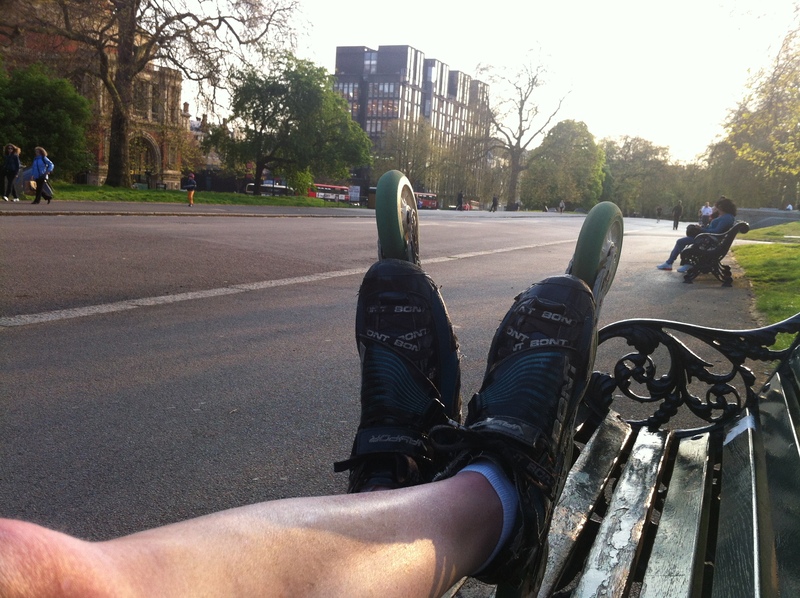 Mike’s custom bont skates, now seven years old but still going strong. I’m having a little relax on a park bench by the Albert Memorial, having just cycle commuted here. My cycle commute is fairly long, 23 miles, so I’m also drinking a little recovery drink, being a Mars milkshake in a bottle. That’s good recovery food as it has roughly three quarters fast carbohydrate and one quarter protein content. Recovery food is very important when you’re doing a lot of exercise. It maximises the benefit you get from the training you’ve just done, and it prepares you for the next bout of exercise. Look on this as fuel for tomorrow’s cycling and skating, and for the day after also. If I miss out on recovery drink, I know that I’ll be suffering within days. I’m about to start a skating lesson here, and will then ride home again afterwards, where I’ll have some more recovery drink, this time probably skimmed milk with Nesquick added. These skates don’t look awesome, but they are. They are by far the best skates I’ve ever owned, and are over seven years old at the time of this post. They look a bit battered, but I think remarkably good for seven years of full time skating. The boots are still stiff and fit me as well as they did when I first got them. I had these custom skates made back in 2006, and they are the first model of Bont Vaypor skates, custom boots expertly moulded by Vincent Henry.